Gainesville is a university community located in North Central Florida midway between the Atlantic coast and the Gulf of Mexico. The area is known for its natural beauty with its stately live oaks and many springs, lakes, and rivers. There are a number of parks in Gainesville and the surrounding area where residents and their families can enjoy swimming, boating, fishing, bicycling, camping, and other sports. The climate encourages outdoor activities throughout the year. 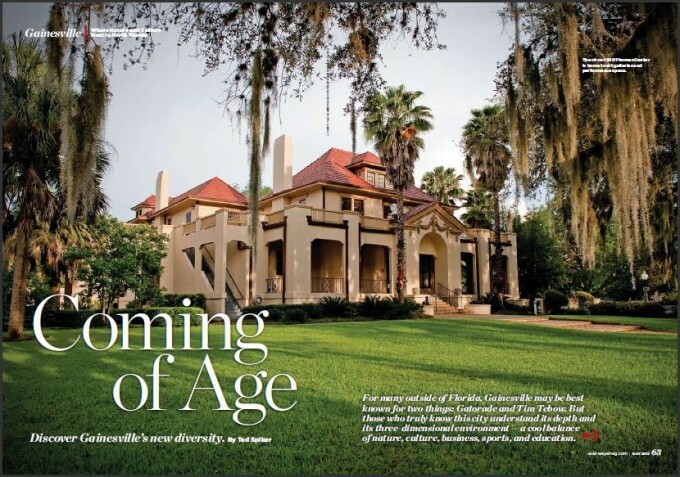 Gainesville offers the excitement of a large city with the convenience of a small town. Culturally, the city is enriched by the influence of the University. The population of Gainesville is approximately 111,000 with a surrounding population of 220,000. The city offers a diverse cultural environment, excellent public schools, and a low cost of living, which makes Gainesville an attractive and affordable place to live. Gainesville was ranked #1 in the Top 10 College Towns: Great Cities for School & Life After Graduation by Livability.com. UF Performing Arts (The Phillips Center for Performing Arts, The University Auditorium, The Baughman Center) – hosts a variety of musical and theatrical events in three venues.